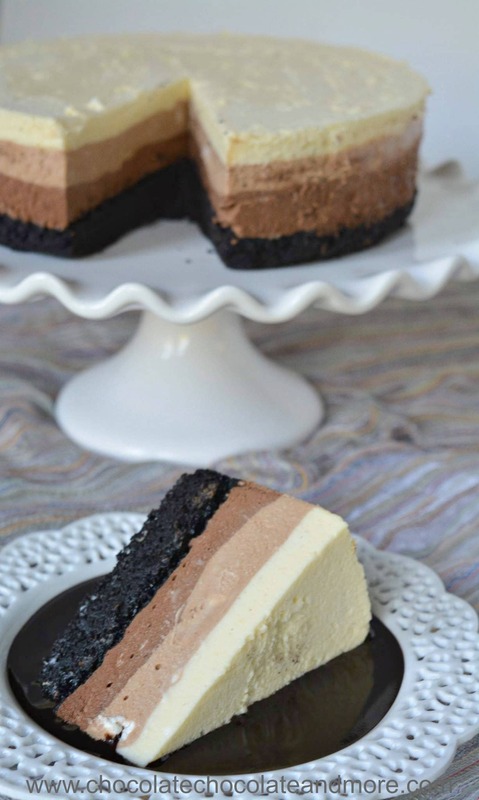 Brownie-Bottom Triple Chocolate Mousse - Chocolate Chocolate and More! 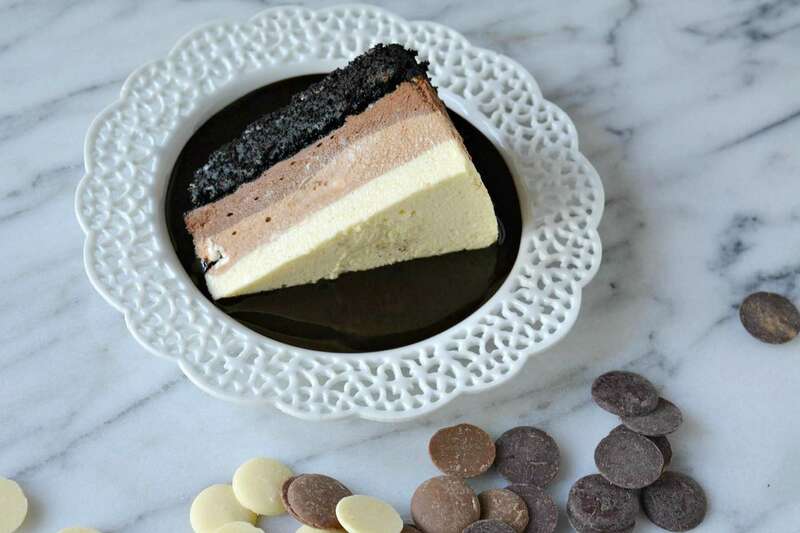 Brownie-Bottom Triple Chocolate Mousse – Oreo-flavored brownie, dark chocolate mousse, milk chocolate mousse and white chocolate vanilla mousse. 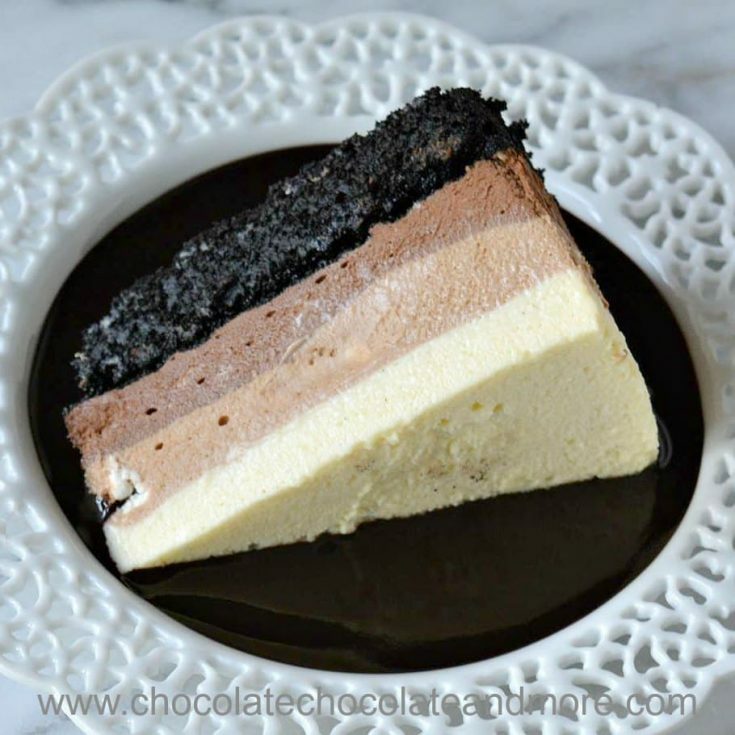 My friends call this dessert “Death by Chocolate” and it’s a great way to go. High quality Santa Barbara Chocolates give this dessert robust flavor. It’s Lent and we Orthodox Christians typically abstain from eating dairy products and meats. This means I’ve been making and giving away some seriously delicious desserts. Easter is coming and it’s time for something really special. I’ve been wanting to make this dessert for some time. It looks like a lot of work but don’t be deceived. The three mousses all start with the same custard base. Put each type of chocolate in a separate bowl. Pour hot custard on top and stir. Fold in whipped cream and layer on top of a brownie crust. Brownie-Bottom Triple Chocolate Mousse does require quite a few dishes – 7 bowls and thee pans – but that’s what dishwashers are for right? Because I want this to be extra special, I’m using top quality ingredients in my Brownie-Bottom Triple Chocolate Mousse. Santa Barbara Chocolate is a small company in California that uses ethically sourced cocoa in their products. They also work with a Belgian company to make all their chocolate disks so you know that’s good. They sent me some chocolates to try this year and I’m using five of them in this recipe. I used Rainforest Black Cocoa Powder in my brownie layer. This cocoa powder really is black. 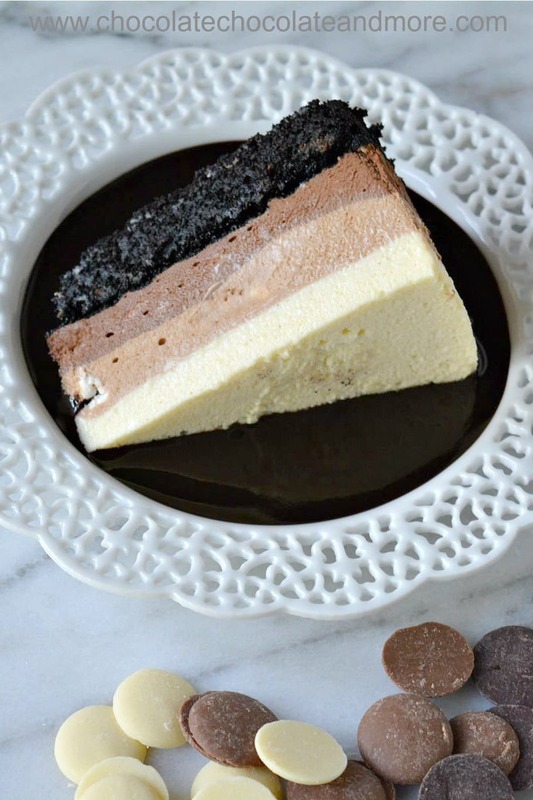 It gives baked goods a deep chocolate flavor like oreo cookies. It comes in a 3 pound bag which will last you a LONG time because a little bit goes a long way. I’ve had my bag for a year and only used maybe a quarter of it. I tell you I’m in love with this cocoa powder. It’s so much chocolatier than regular brown cocoa. Dark chocolate is my favorite and Santa Barbara Chocolate has many excellent choices. Because I made a bittersweet chocolate sauce to go with this, I chose the organic dark chocolate couverture 60%. It’s a single source non-GMO chocolate from Hispaniola and 60% cocoa. When I combined it with the custard, the resulting mousse was semi-sweet. Any of their dark chocolates would work well. If you want to go even darker, try the 75% Trinidad dark chocolate. I used this chocolate in the bittersweet chocolate sauce and I probably use it the most in my baking because I can add sugar to make it as sweet as I want. Rainforest Milk Chocolate has 45% cocoa. This is a bit more than most milk chocolates so it’s a little less sweet and a bit more chocolaty than regular milk chocolate. Going a little less sweet on the milk chocolate helps make the white chocolate layer less overpowering. White chocolate can be tricky. If you buy cheap white chocolate, it can separate when it melts and then you have a mess. Rio Tigre White Chocolate melts beautifully. I used this chocolate for my orange creamsicle truffles and my white chocolate chai truffles. It’s almost foolproof so a safe bet in dishes that require melted white chocolate. For those of you living in hot climates, Santa Barbara Chocolate ships with ice packs so my chocolate has always arrived in good condition even in the Texas heat. And, you can reuse the ice packs for picnics (or when you’re buying groceries on a hot day). 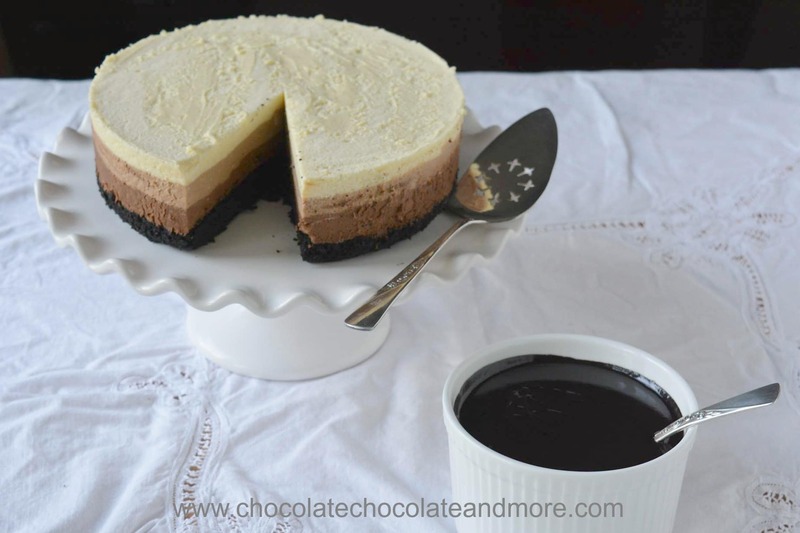 For a no-bake version, make just the triple chocolate mousse and the bittersweet chocolate sauce. For an oreo-flavored dark chocolate treat, make just the brownies and the bittersweet chocolate sauce. Only want one flavor of mousse? Use 9 ounces of the chocolate of your choice and pour all of the hot custard over the top. Heat the oven to 350F. Line an 8.5" springform pan with parchment paper. (I set my pan on top of the parchment paper, traced an outline of the bottom and cut the circle out to fit.) Set aside. In a mixing bowl, with the paddle attachment on, beat the sugar and the eggs until fluffy and thickened, about 5 minutes. Beat in the softened butter and vanilla extract. Gently, fold in the flour, cocoa powder, baking powder and salt. Stir until just combined. Remove from the oven and cool completely on a wire rack before cutting into bars. Beat egg yolks and sugar until pale yellow and thick. When you lift the beaters, it should form a ribbon that sits on top of the mixture before sinking in. Gradually whisk scalded half and half into the mixture. Transfer to a heavy 2 quart saucepan. Cook over low heat constantly stirring with a spatula until thickened (about 10 minutes). Do not boil. Remove from heat. Add gelatin and stir until gelatin is no longer visible. Immediately divide the custard into three equal portions among the bowls with chocolate. (it should be a little over 2/3 cup custard per bowl). Let sit for about a minute to let the chocolate start melting. Stir the white chocolate and custard together until well combined. Add vanilla to the white chocolate bowl and mix. Then stir the milk chocolate and custard together and then the dark chocolate and custard. When the chocolate custard bowls have cooled to room temperature, beat chilled whipping cream in a chilled bowl until stiff peaks form. Divide evenly among the three chocolate bowls. Starting with the dark chocolate, fold in the whipped cream. Pour onto prepared brownie and tap sharply on the counter to remove bubbles. Fold the whipped cream into the milk chocolate custard. Carefully layer this on top of the dark chocolate layer. Tap on the counter to remove air bubbles. Fold the remaining whipped cream into the white chocolate custard. Layer on top of the milk chocolate. Cover with plastic wrap so the plastic wrap touches the top (this keeps a film from forming). Refrigerate at least 4 hours or until completely firm. Put water, sugar, cocoa and 2 tablespoons butter in a saucepan. Heat on medium until the mixture boils. Reduce the heat and simmer for 5 minutes. Let cool to lukewarm while you melt chocolate. Cut the remaining 4 tablespoons of butter into small pieces and mix into chocolate disks in a medium sized bowl. Melt the chocolate and butter by microwaving for 1 minute. Stop every 15 seconds to stir. Once the chocolate is mostly melted, stop heating and let the residual heat melt the chocolate the rest of the way. Gradually stir the cocoa mixture into the melted chocolate. If desired add the brandy. Store at room temperature up to 4 hours. If you refrigerate, you will need to reheat before serving. This dessert can be frozen. This looks fabulous, Gail. But the 8.5″ springform pan has me stymied! I have 8″ and 9″; is it better to go down or up in size? I’m not sure where I picked up the 8.5 inch pan (probably a garage sale). either the 8 inch or 9 inch will work. I’d go with the 8 inch because then your layers are a little thicker.